Manan Ahmed, Associate Professor, is a historian of South Asia and the littoral western Indian Ocean world from 1000-1800 CE. His areas of specialization include intellectual history in South and Southeast Asia; critical philosophy of history, colonial and anti-colonial thought. He is interested in how modern and pre-modern historical narratives create understandings of places, communities, and intellectual genealogies for their readers. He is currently finishing his second monograph for Harvard University Press. The book is a history of the concept “Hindustan,” drawing upon histories produced in the subcontinent as well the European philosophy of history in the early modern and modern periods. He is the co-founder of the Group for Experimental Methods in the Humanistic Research, which focuses on “mobilized humanities” and innovations in scholarly methodologies. One of the recent projects, Torn Apart/Separados focused on the humanitarian crisis on the southwestern border in Summer 2018. He has broad interests, and projects, in the history of archives in the global south and the problems of access and control to digitized materials. He is working on a project of spatial visualization in medieval Arabic and Persian histories— including “Mapping Mughal Hindustan, 1500-1600” and “Delivering Post by Foot in Medieval North India”. 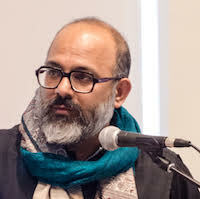 He is one of the faculty conveners for the five year supranational project funded by Mellon, “Decolonization, the Disciplines and the University” (2019-2024) and the “Manuscripts of the Muslim World”. Manan Ahmed teaches “History of South Asia I” — a survey from medieval to the early modern period — in the Fall semester. His other regular courses are “Worlds of Mughal India,” “Borderlands: Towards the Spatial History of Empire,” “Walking & Colonialsm.” He incorporates a Digital History Lab with most of his courses. The syllabi for the various courses are available here. His articles and book chapters (and reviews) can be accessed via Columbia Academic Commons. 2016 A Book of Conquest: The Chachnama and the Origins of Islam in South Asia. (Cambridge, MA: Harvard University Press, 2016). 2015 Co-Editor “Enchanted Politics: Humans and other Animals across South Asia and the Middle East,” Comparative Studies of South Asia, Africa and the Middle East, 35: 2 (2015). 2012 Co-Editor. “Fractured Genres: The After-Lives of Medieval Indo-Persian Histories,” Indian Economic and Social History Review, 49:4 (December 2012). 2019 “Technologies of Power: From Philology to Big Data,” in Spheres: Journal for Digital Culture, forthcoming. 2014 “Idols in the Archive,” Journal of Asian Studies, 73, no. 1 (February, 2014): 1-8. 2013 “A Demon with Ruby Eyes,” The Medieval History Journal, 16, no. 2 (October 2013): 335-369. 2012 “The Long Thirteenth Century of the Chachnama,” Indian Economic and Social History Review, 49, no. 4 (December 2012): 459-491. 2011 “Adam’s Mirror: The Frontier in the Imperial Imagination,” Economic & Political Weekly, 46, no. 13 (March-April 2011): 60-65. 2019 “Narratives of Earliest Hindu-Muslim Encounters,” in Oxford Handbook of the Mughal World, forthcoming. 2015 “The Advent and Spread of Muslim Rule in South Asia,” in History of Pakistan, edited by Roger D. Long (Lahore: Oxford University Press, 2015), 135-167. 2013 “Future’s Past” in South Asia 2060: Envisioning Regional Futures, edited by Adil Najam and Moeed Yusuf (London: Anthem Press, 2013), 46-52.